A less popular member of the pea and bean family, Fenugreek (Trigonella foenum-graecum) has been domesticated for both culinary and medicinal purposes. The plant is used as a cattle crop, while its seeds are collected for human consumption and greatly appreciated for their high nutritional value and beneficial health effects on the digestive, respiratory, circulatory and immune system. Fenugreek seeds make an excellent tonic, ideal for reversing nutritional deficiencies and restoring vitality. They combat fatigue and reduce brain fog. Fenugreek seeds are a rich source of minerals such as copper, iron, magnesium, manganese and zinc. They are used to treat mild digestive disorders and improve lactation in new mothers. Fenugreek seed decoctions are meant to improve liver activity, stimulate the appetite, loosen stools and soothe the stomach mucosa. Infusions help treat sinus problems, cough and keep blood sugar levels and cholesterol under control. Moreover, regular consumption is believed to help manage and treat anemia caused by iron deficiency. What does fenugreek look like? The fenugreek plant looks very similar to three-leaf clover. Its seeds however have a more peculiar appearance in the sense that they are somewhat corn-shaped, with a brown to amber color. Fenugreek seeds are rather hard so don’t worry if your coffee grinder won’t take them. What do fenugreek seeds taste like? Fresh fenugreek seeds have a bitter, yet pleasant taste and a strong maple syrup aroma. Yes, maple syrup! Roasted fenugreek seeds have a nutty flavor and a more bitter taste. You can find fenugreek powder or infusion bags in health stores. Fresh and dried fenugreek as well as fenugreek seeds are available in many Middle Eastern markets, especially Indian markets. Fenugreek leaves and sprouts are also edible and go well in salads, stews or other traditional dishes such as Indian flatbread, sabzi, while fenugreek seeds go well in chutney, curry, dosa (a sort of Indian fermented crepe) and so on. Fenugreek seeds are a rich source of minerals, vitamins, fiber and important compounds with great health benefits such as saponins, hemicellulose, mucilage, tannins and pectin. The seeds are 65% fiber and thus help reduce the glucose absorption rate at the intestinal level. 100 g of seeds have 24.6 g of dietary fiber, while one tablespoon has 2.7 g of fiber. This stabilizes sugar levels in the blood and contributes to a better management of type 2 diabetes as well as prevents energy fluctuations, ensuring steady energy levels. The saponins in fenugreek, alongside fiber and 4-Hydroxyisoleucine (an amino acid) are responsible for lowering both blood glucose and cholesterol levels. For this reason, the seeds are recommended for consumption because they help keep blood sugar and cholesterol levels low, being an ideal food for anyone suffering from diabetes or cardiovascular disease, especially atherosclerosis. Moreover, the fiber and pectin (a polysaccharide) found in fenugreek seeds increase stool volume and thus help relieve constipation naturally. However, when eating fiber-rich foods you should remember to also drink plenty of water to the fiber has liquids to absorb and add bulk to stools. Mucilage present in the seeds protects the stomach mucosa against irritants, reduces inflammation and allows it to heal. It does the same for other mucous membranes in the nose, throat and lungs, hence the cough-suppressing and expectorant properties of fenugreek. Traditionally, fenugreek herbal infusions or decoctions were used as a natural demulcent to soothe a sore throat, help liquefy and expel phlegm and provide cough relief. 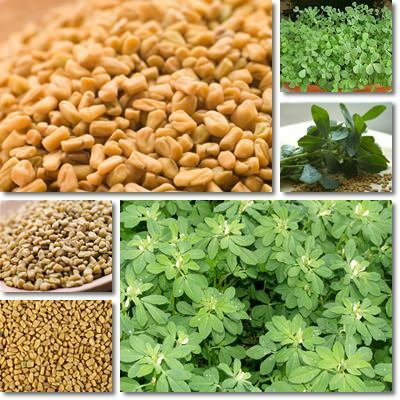 Other phytochemicals found in fenugreek are choline, trigonelline, diosgenin, yamogenin, tigogenin and neotigogenin. Choline promotes fetal brain development and is thus a key-nutrient during pregnancy. Another very important health benefit of fenugreek leaves and seeds consumption is the increase in milk flow in new mothers. Fenugreek and other herbal remedies are often recommended to lactating mothers to increase milk flow prior to prescription medication because they rarely present any side-effects. Although fenugreek can be taken in doses ranging from 5-8 grams/day (depending on what your doctor recommends), it is generally safe for consumption. If you have eaten too much fenugreek, you might experience some of the following signs and symptoms: nausea, gas, bloating and other digestive upset. Also, it might be best to limit you intake if you are suffering from asthma or allergies because too much fenugreek may worsen you allergy symptoms. Eating fenugreek seeds or drinking fenugreek tea will most likely make urine, sometimes milk smell like maple syrup or loosen stools. However, these symptoms are of no concern because they will disappear as soon as you discontinue consumption. If you take a look at the nutritional table above, you will see that fenugreek is a great source of minerals, making it an excellent tonic. The high iron, copper, manganese, magnesium, phosphorus, zinc, potassium and calcium content in the seeds promotes recovery and helps energize the body. Iron (419%) helps create new red blood cells, combats muscle weakness and low energy levels, both symptoms of anemia. Copper (123%) prevents premature aging signs such as discolored iris or gray hair. Magnesium (48%) ensures healthy muscles, heart included, and increases calcium absorption in bones. Manganese (53%) has a powerful antioxidant activity and protects against oxidative stress. Conclusion. Overall, fenugreek seeds (leaves and sprouts) are an excellent natural laxative, digestion aid, cough, sinusitis and bronchitis remedy. They keep blood sugar, cholesterol and triglycerides levels low and thus help manage diabetes and cardiovascular disease. Fenugreek is great for new mothers because it increases milk flow. However, it should be avoided during late pregnancy because it might cause premature labor. If you are taking anticoagulant medication, it might be best to avoid fenugreek because it may cause bleeding.